Next week we have a break and then we plan to spend a week working on our own ideas – anything you like – either bring in a project that you are working on and Kieran and I will try to give advice or just start a new one in the class and we’ll try to get you off on a good footing. A WebGL 3D Solar System! The code is up on github as usual! Click here to view the project we did on Saturday! The great thing we found about p5.js 3d is that is is REALLY similar to the 2D shape functions, so much so that we all intuitively were able to get going with little need to look at documentation. Sadly, it’s not easy to mix 2D and 3D code in P5 as the “canvas” is created differently. Using these basic building blocks, it’s possible to create all manner of shapes. There is also a “loadModel” function that allows you to read in a model from a 3D package like “Blender”. These can be models of spaceships, bad-guys, houses, ponies, whatever you like! Maybe at some stage in the future we’ll try to learn a bit about blender. One of the ninjas already had played with blended and managed to load in a model of a meteorite he’d been working on! The models and shapes don’t have any coordinates on them – it’s all stuff like size and grid size. Our first program involved creating a box and moving it around. Push() and pop() can be used to stack the transformations on top of each other – just like in the 2d sketches! pointLight is a light which is centered on a point. It just has a color and a position – e.g. pointLight(r, g, b, x, y, z). Pointlights are pretty dim, but you can stack lots of them on the same location to make them brighter – this is what we did for our sun! directionalLight is a light which has a color and a direction – this is very similar to the pointLight except that the light just shines in one direction and can be used for e.g. spotlights. For each of these types, you simply set the material before drawing the shape – kind of like the fill function. Our “Solar System” code was very basic – what we have here was one planet orbiting around a Sun in a spherical orbit, with a moon orbiting around that planet. We didn’t have any physics in there – just spheres orbiting each other. This sounds like a lot but the code is really simple and can be seen here. We did one planet and moon in the class because a lot of the time was spent playing with our own projects. How about you take our solar system and change it so that all the planets have accurate relative rotation speeds? i.e. Try putting a ring (torus?) around Saturn! The distance from the sun could also be put in, but it might be a bit weird looking – in fact you wouldn’t even see most of the planets as they get pretty spaced out as you move out! We started work on on our scrolling platform game this week and I showed you all how to get started. You can customise even further to suit your game as the weeks go on . 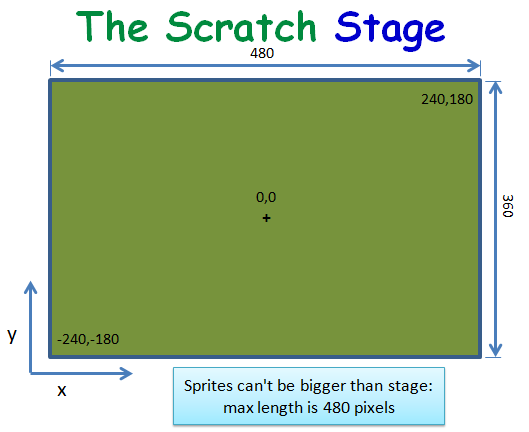 To understand the concept, you must understand that the STAGE is only 480 pixels wide (x goes from -240 to +240). No one SPRITE can be larger than the STAGE and we won’t be able to see a SPRITE that isn’t on the STAGE (ie. it’s x position is less than -240 or greater than +240). So we have to set up a series of SPRITES that extend past the stage and move them across the stage from left to right and under Mario’s feet to make it look like he is moving over the ground from right to left! 2. Next, we drew our own Ground SPRITE using the PAINT NEW SPRITE button. Important!! The sprite must be the full length of the stage!! See the 1st picture above for an example of what the ground sprite could look like. Mine looked like a brick wall, but yours can look like a stone wall or concrete one or some kind of footpath or road. 3. Now we must code our Ground SPRITE! We need to set it’s inital x position to zero and continuously move it in a direction for as long as we are pushing the right or left arrow buttons. To do this we need a new VARIABLE called XPOS. Go to DATA and create this new VARIABLE. 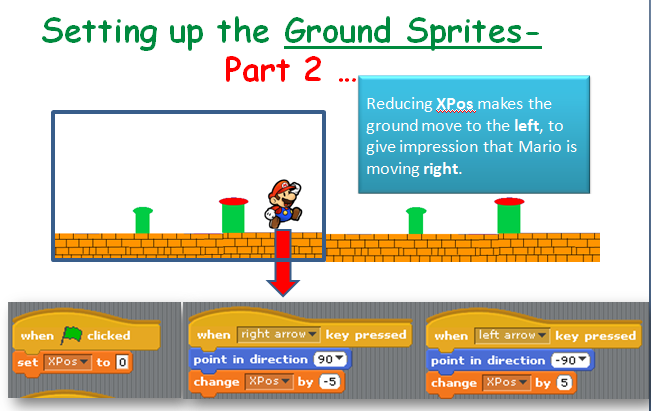 See the image below on the bottom the instructions for setting up the initial position of the first ground SPRITE. 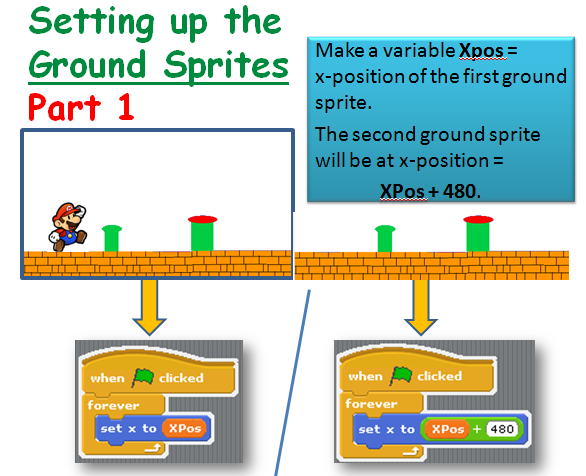 After you create and code the first one, we can duplicate Ground SPRITE 1 and create Ground SPRITE 2. Be sure that Ground SPRITE 2 has an xpos set to 480 pixels more than Ground SPRITE 1. 4. Lastly, for this week, we need to get the Ground SPRITES to move!! !!IMPORTANT! !Click the little i button on your Ground SPRITE and see all the information about the SPRITE. Change the rotational direction of the Ground SPRITE to non-rotational. It is a button that looks like a dot. We will add some obstacles this week and maybe have some rewards for our character as well. This week we took a break from hardware and we looked at Pygame Zero. Pygame Zero is for creating games quickly and with fewer lines of code than would be used with Pygame. It is intended for use in education, so we can learn basic programming without needing to understand the Pygame API or how to write an event loop. You may need to install Pip if you didn’t install it when you installed Python. To do this go to Control Panel/Settings and then Add/Remove Programs, scroll down and click on Python then click on modify, tick the Pip check box and save your changes. We will be using Pygame Zero for graphical input/output in our projects but if you want to have a go at writing a game, CodeConjuring’s Froggit youtube tutorials are a good place to start. This week in Creators we looked at a brand new concept – functions that actually call themselves – also known as recursion. Though this seems at first glance like a really silly thing to do, we were quickly able to use it to generate some pretty effects. 1. Make sure to give it something that will let it exit – a function calling itself forever will not work and the browser will crash or throw an error. For us, we passed a value as a parameter and made it smaller each time, exiting when it fell below a certain value. 2. Do the math! Recursion leads to big numbers of operations very quickly and can slow down or crash a browser easily. Make sure to save often and think about the amount of times your function will run. Recursion is really handy for cases where there are lots of operations that are similar. Notice the If statement? This means that it will not bother drawing circles smaller than 5 pixels in diameter – this allows the code to work. For the next project, we used very similar code to create a beautiful fractal tree. In this case we wrote a “drawBranch” function which can draw a branch at a given angle and length. We added a little code to allow us to change the angle that the branches fan at – the fanangle – dynamically. Depending on the variables, we could slow down our computer quite easily – the trick is to think about how many lines your computer will need to draw. As usual, all of our code is on the Creators 2017 github repository.